QUESTION: Mr. Armstrong, thank you for your excellent commentary. Could you comment on the monetary system in Britain during the period following Rome’s waterfall event? I would be especially interested in the period following the capture of Valerian I through the 9th century. ANSWER: I suspect that the purpose of your inquiry is the loose history taught in Britain that there was a usurper in by the name of Carausius (287-293AD). 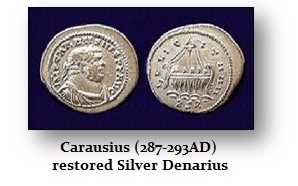 He actually did reintroduce silver which compelled monetary reform in Rome under Diocletian (284-305AD). Effectively, there was a previous usurpation which was really a separatist movement you can call ancient BREXIT. 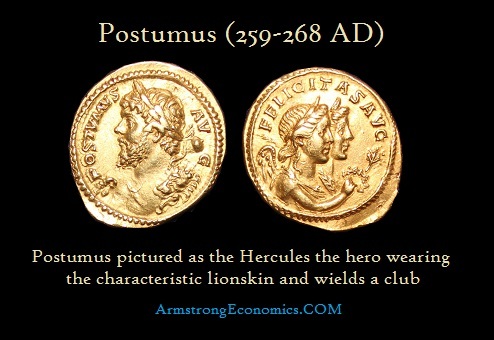 That was led by Postumus (260-268AD) who made his move for power upon the capture of Valerian in 260AD. Interestingly, there were 34 intervals of 51.6 years from 260AD that brought us to 2014/2015 for the rise of BREXIT. At least cyclically, it was on time and this was just one component that the computer attributed to the success of the BREXIT referendum. I have written the full account of the rise of the next attempted usurpation by Carausius. 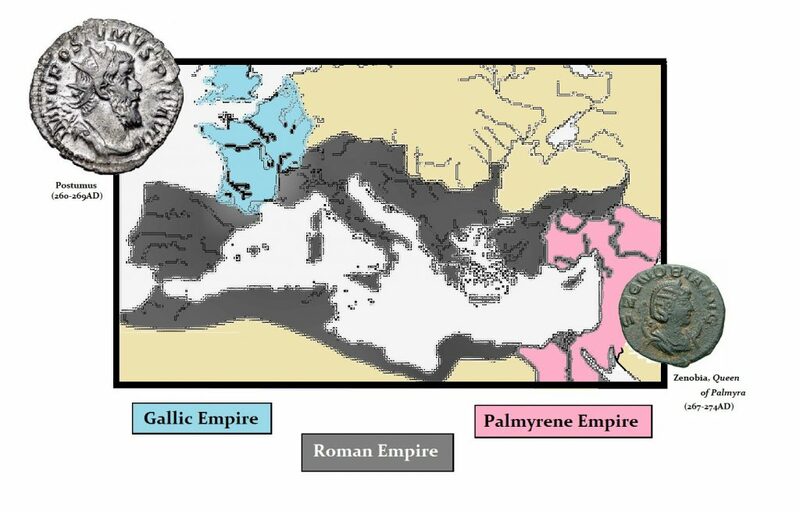 While the first separatist movement failed when Postumus’s successor Tetricus I surrendered in 273AD ending the Gallic Empire, the next usurpation came into play 14 years later in 287AD with Carausius. This attempt at a separatist movement was ended by the father of Constantine the Great – Constantius I Chlorus. This is a medallion showing him entering London. 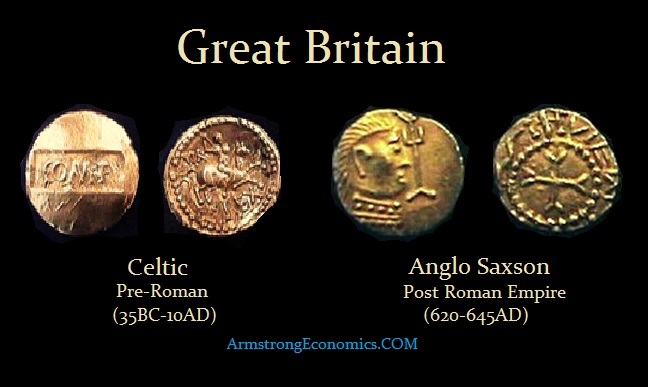 After the fall of Rome, we see gold Thrymsa appears in Britain around 620AD. There begins a debasement process and by 675AD (about one 51.6-year ECM wave) what use to be gold vanishes and is replaced with silver. We see a brief political issue of gold under Offa (757-796). 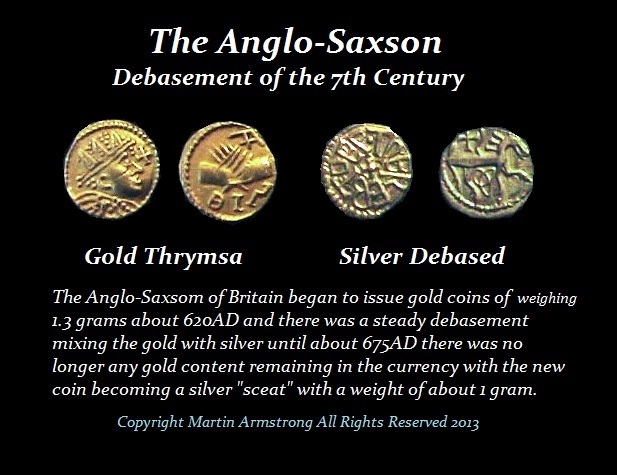 Other than that issue, gold does not reappear again until Henry III in 1257.